When family came to visit last weekend, my niece and nephew had a ball making this fun and festive Halloween healthy recipe. Just a few ingredients, a little prep, and BOOm! A yummy mummy dog. It's an easy, healthy eating snack to make with a group of little (or big) goblins. Wow. This looks yummy. 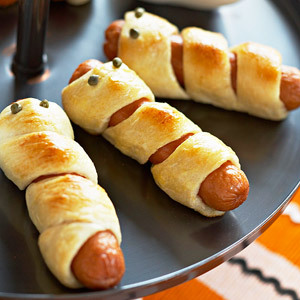 It doesn't whether this is for Halloween recipe only. But I still wanna try this. Thanks for sharing anyway.